I created some cute reversible 5"x7" photo boards for Cool2Craft and Ranger Ink using Perfect Pearls pigment powders and mist sprays to create textural backgrounds that enhance the theme of the photo. Click here for my project instructions and video tutorial. I've never made a wind chime before - now I feel like quite the engineer! 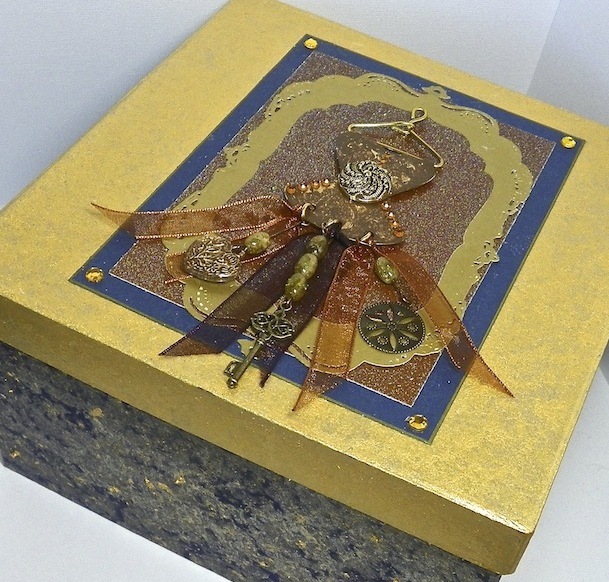 Spellbinders Media Mixage metal blanks do make a lovely little tinkly noise in the breeze...click here for my project instructions and video tutorial. This is a great way to use up random beads, too. This picture is very tall. I feel like I need to write more to fill up the space beside it. You can't tell, but I edited out a little bird poop that was on the fence. This project was hard to shoot because of the sunlight glinting off the blanks, and because of the breeze twirling them sideways. This was the only shot where I actually got most of the blanks to face out. Ok, I've reached the end of the picture now. Hee! I love treating the lid of a gift box like a canvas for mixed media - my latest project for Spellbinders and Cool2Craft is extra special. But now I kinda want to rip the dress charm off the box and wear it like a pendant around my neck! I really love how this turned out. Click here for full project instructions and my video tutorial. This month my ATC group's theme was metal. I used one of the Spellbinders texture plates to emboss some of their purple foil sheets, then sanded the surface to let the silver foil from underneath peek through. It's glued to cardstock and the vine is a chipboard die-cut colored with a stamp pad. My friends Liz, Cathy and Uni had fun embossing and painting metal surfaces for their ATCs...I love all the charms, too! My little dog Suzie always wants a piece of the act! As soon as I put the pillow on the sofa to snap a picture of it, she jumped right up and plopped herself right in front of me. She gets a little "what about ME?" when I spend too much time arting and crafting, and not enough time playing with her, lol. This pillow was really fun to make with muslin and scraps of colorful fabric. Claudine's adorable foam and acrylic stamp illustrationss make it even more fun to paint-stamp a cute little scene. 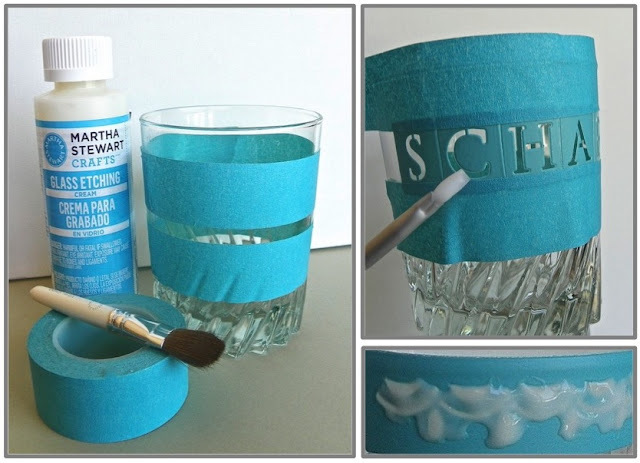 Check out my video tutorial and project instructions on Cool2Craft. This weekend, I had a go with glass etching cream from Martha Stewart Crafts. I had this one stray tumbler, so I thought I'd personalize it with my mother's name, Scharlene. Her name has a unique spelling, so there has never been a mug or keychain or magnet with her name already on it. I think this will make an elegant holder for little chocolates or mints on the table next to her favorite chair. It was much easier to etch glass than I thought it would be—especially with Martha's adhesive stencils. The final etched glass is even dishwasher-safe (top rack)...although I wish that mattered to me...alas, I have no dishwasher in my little kitchen, lol. I started with a stripe all the way around, using the Martha Stewart painter's tape, which has a nice bit of stretch to it for cylindrical objects. Just dab the cream on fairly thickly with a brush, let it sit for 15 minutes, then rinse off the excess cream...now you're etched and ready to do the next part of the design. I used the stripe as my guide for running the letters of her name around the glass with the adhesive stencils...very important to dab the cream on carefully so as not to get any streaks or globs on the glass where they don't belong, so I used a smaller brush to keep the cream out from between each letter. I used more painter's tape on the top and bottom as an extra precaution...etching where you don't want it is not an easy craft fail to cover up. Then I ran the little 3" scroll border design around the lip of the glass, one section at a time, making sure to end it at the back of the glass, opposite the name. It actually measured out pretty evenly. I embellished the tumbler one step further by gluing a thin lavender ribbon between the stripe and the letters and then I added a few little adhesive pearl accents. Until then, have a look at all these amazing projects using Martha Stewart Crafts glass paints and etching cream! Look for the full product line at Michaels Arts & Crafts stores. Disclosure: I wrote this post as part of a sponsored campaign with Plaid and The Blueprint Social. All opinions and love of Martha Stewart Crafts are my own. 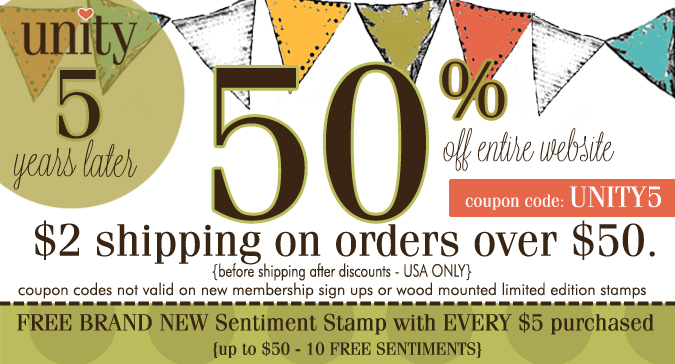 A group of wonderful designers (including yours truly) are celebrating the official launch of my friend Ann's new line of rubber stamps. Scroll down and get to hoppin' through all their blogs to see lots of great projects. There are four different sets, each with six unmounted stamps, available in either 1" or 2" size - you get a combination of squares and triangles. I love how you can create so many different "patchwork" combinations by grouping the stamps in random ways on an acrylic block. Then you stamp, rotate a quarter turn, stamp again, rotate a quarter turn, and so on. From these individual little 1" stamps below, I was able to create this wonderfully symmetrical 4" block pattern above, complete with a leafy scroll in the center. Ann designed a super versatile set of stamps - there's so many patterns you can make with just one set...but you're gonna want them all. 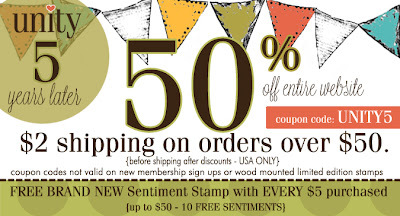 So be sure to take advantage of this special half-off sale on the Unity Stamp site...enjoy!